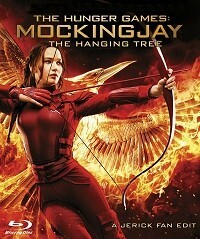 "The Hanging Tree" is a combination Mockingjay Part 1 and Part 2 edit completely reworked to make the strongest Hunger Games finale possible. Nearly 90 minutes of Hollywood excess has been cut from the original feature while maintaining story continuity and narrative vision. Don Skonecki for creating the disc artwork. Mockingjay Part 1 original runtime 123 minutes has been reduced to 61 minutes. The beginning of the movie has been completely changed, I have merged the track "Remind Her Who The Enemy Is" from the Original Score with the track "The Hanging Tree" to produce the score for the beginning of the film. "From the Treaty of the Treason:"
"And the peace will be a contract. in return for order and security. This is a condensed version of President Snow's speech from Mockingjay Part 1 that has been cut in this edit. The movie then begins with the attack on the Hydroelectric Dam in District 5 followed by the titles "2 Months Earlier" "District 13"
The rebel attack in the woods leads directly to Peeta's third interview where he speaks about the rebel attacks on the grainery and dam. Mockingjay Part 2 original runtime 137 minutes has been reduced to 110 minutes. The scene where Snow is made aware of Katniss' being caught on video alive following the tar trap has been cut along with the first indication that Snow is dying from the poisons in his body. This reveal works much better as a surprise to the viewer at the end of the movie, humanizing him at a time where he has already lost all of his power. The scene where Gale and Peeta discuss who Katniss loves is cut. There is no indication in this edit or in the trilogy of movies as a whole that Katniss would have ever ended up with Gale, it was a terribly developed plot device throughout, and has been rightly eliminated. The idealistic ending where poor CGI and makeup effects are used to age up Katniss and make her look more like her mother has been eliminated completely. I accept that this change will be hard to accept by purist followers of the book. But I emplore you to see this movie for what it is, a gritty ugly war movie. A thought provoking tender moment of 2 characters learning to live with the atrocities they've experienced is much more satisfying than a "everything worked out great in the end" finale. If the film-makers hadn't decided to waste so much time and money stretching this book out to two movies for no good reason, then we probably would have gotten something like this. I have to say, pretty good combination of both parts, into an almost 3 hour cut. Very seamless, works like one solid movie. There is a lot of material cut, some is a tad bit important for character development and the narrative, but it's alright in my mind. I thoroughly enjoyed this edit, and I would definitely recommend it. The editing is superb and professional. I'm not going to go into a huge exposition as to what's great and what's not. The editing is top notch, this guy really knows how to keep the energy and narrative flowing through vigorous editing. The video/audio quality is A+, literally like watching the official Blu Ray. This guy is gifted in the art of editing. Now, my biggest grievance is with the choosing of material he's cut from the film. 80% of what he's edited out is filler and is mostly unnecessary and it makes for a much tighter and cohesive viewing experience. But there are some KEY scenes that were removed from the film and it just didn't work for me at all. It's like he did an excellent job editing out over half the filler in part one, and let the majority of part two play out. He took out some very tense, important scenes and it left the movie lacking. The COMPLETE removal of all scenes involving the taking of Disctict 2 was baffling. Not to mention the removal of the entire rescue mission in part 1. After what appears firstly to be a tightly cut action/sci-fi finale, it just turned out to be disappointing. The largest impact of the District 2 scenes on the film is the injury to Katniss at the hands of a Capitol fanatic and the resulting emboldening of the rebels as a result. The exact same description can be given to what happens when Peeta attacks Katniss after being brainwashed by the Capitol, so it works as a very simple replacement. The other important exposition that happens during this sequence is the revelation that the District 13 army will do whatever it takes, however unethical, to bring down the Capitol. While this is an interesting development in the movie, I think it is much more powerful to leave this revelation to the very end so that at first you really question whether Coin bombed the Capitol children. You say that District 2 is an important turning point in the war, and maybe it is in the book I honestly can't say, but it does not play out that way in the movies. There are no scenes in the movies that follow the district rebels and how their motivations develop, the movies focus almost entirely on how they respond to the propaganda that is being released about Katniss. Therefore her survival of the bullet wound and subsequent actions are no more powerful in the movie than her survival of the attack by Peeta. Ever since Harry Potter and the Deathly Hallows, it seems like it’s been the trend to break up a trilogies into fours. Jerick has done the service of editing Mockingjay into one film. I’ve read the Hunger Games, but I don’t remember specifics, so I can’t say how this flows with the book. I can say that this film, for me, really strengthens the films. The flow from part 1 to part 2 was unnoticeable to me. Jerick has really done a great job of strengthening the narrative and making this the film that it should be. This edit is a well-crafted project meticulously put together by Jerick. Audio and video flows into one another as though it was the Blu-ray version (i.e. the quality of the edit and source is outstanding). The word flawless has been used before, and rightly so. Just a joy to be able to watch a fan edit without being pulled out of it because of a jarring cut. Nothing seemed out-of-place to me and the narrative works to create a (or THE) final entry in the trilogy. I'd recommend this edit to anyone who seeks a trimmed and tightened version of the bloated two-parter that is HG: Mockingjay. I'd even recommend to watch this instead unless, of course, you are a huge fan of either books or movie franchise and need every single piece of material. I found it difficult to give the Enjoyment-rating a fair number. One the one side, I truly enjoy a great fan edit, but on the other I dislike the entire Hunger Games-franchise. The enjoyment of the edit is in the 9-10 range, while the enjoyment of the movie itself is very low. A compromise has been made but solely due to my dislike of the movie, not the superb fan edit. All in all, a brilliant edit by Jerick!